UX: Effectively triggering emotional responses with smiles and faces. Results of an A/B testing evaluation show how triggering an emotional response / connection from user’s vastly increases their response rate, by 102.5% in this case. This seems to have the marketing power of testimonials, but portrayed in one happy smiling customer photo. A picture is worth a thousand words. 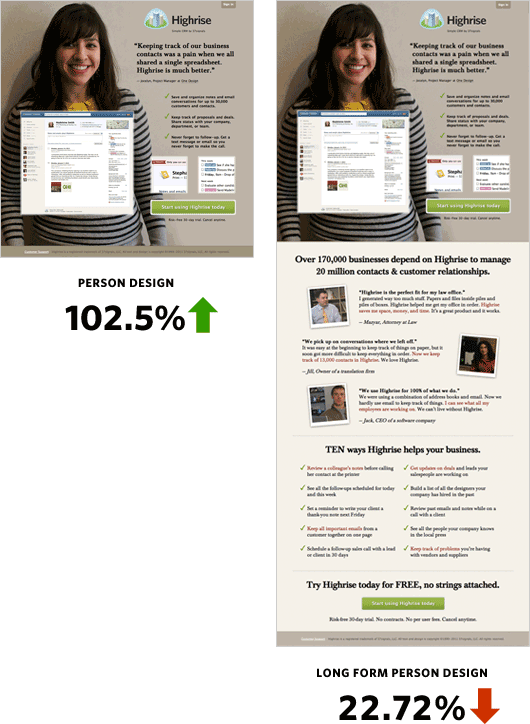 Behind the scenes: A/B testing part 3: Finalé – 37signals. Results of eye-tracking studies have shown how you can grab and guide a user’s eye using a similar emotional response. You look where they look, people look at other people’s faces – UsableWorld.com.au. But just because their eyes have seen an element on a page, doesn’ t mean that they’ve registered it. Look this way, please | Manner of Speaking. Evolutionary psychology and faces for better presentation skills whether you use Keynote or Powerpoint | Les Posens Presentation Magic. Subliminal Messages Work! | Neuromarketing. This entry was posted by Nadeem Bakhsh on August 30, 2011 at 3:06 pm, and is filed under awesome, ux. Follow any responses to this post through RSS 2.0.You can leave a response or trackback from your own site.